How does the hydrological cycle affect urban flooding, and what are the key hydrological processes? 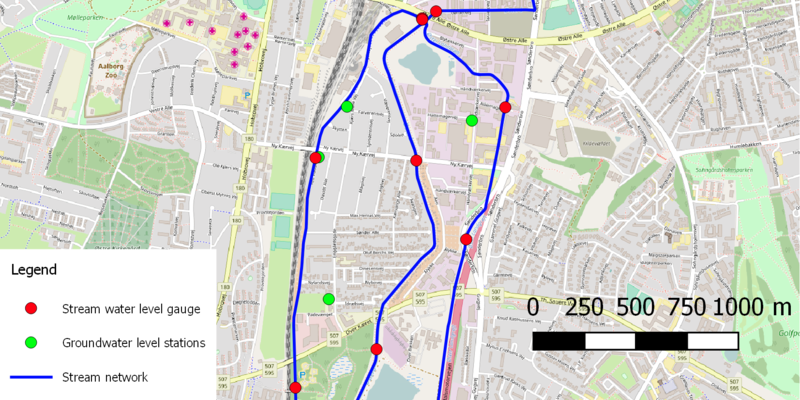 What is the optimal spatial and temporal resolution for input data and urban flood forecasting models, and how does that relate to practical use, model execution time, and end-user specifications? Can complex urban flood models be simplified in order to reach computations speed applicable for real-time forecasting purposes? What is the uncertainty of urban flood forecasting models best described, and how can uncertainty be quantified in a meaningful way to the end-users? The major hydrological processes are monitored in a period of approximately 2 years to establish the interaction between the urban hydrological processes and urban flooding. The other main purpose of the data campaign is to gather data to validate an intergrated urban hydrological model. 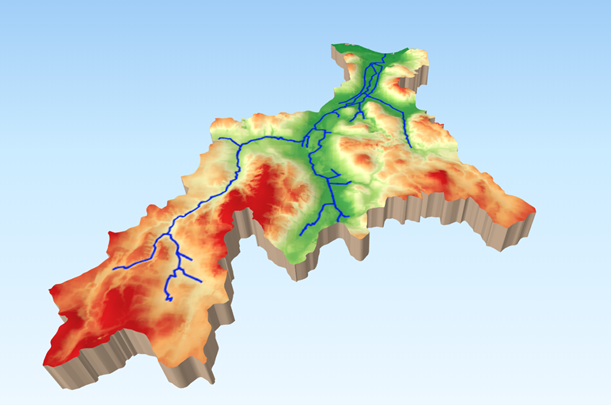 The key hydrological processes are investigated through examination of the monitored data and model exploration. An integrated hydrological model is developed and validated against the data from the data campaign. The model sensivitity in respect to in- and output data is evaluated based on a Global Sensitivty Analysis (GSA). The sensitivity indices are based on flood-relevant output, such as flood depth and extent. It is expected that the sensitivity indices reveal the most influential model input parameters and key hydrological processes. Selected previously flood events from historical data are simulated and cataloged with the purpose of deriving the risk of floods dependency on the input parameter, e.g. rain intensity, soil moisture in top layers, base flow in streams, groundwater level. Hindcasting experiments including perfect forecasts with different lead times and different temporal and spatial resolutions. Uncertainty from the most sensitive input parameters based on the GSA is investigated by multiple Monte-Carlo simulations with randomized input parameters. The uncertainty of model output is scrutinized in order to evaluate a platform for the end-users to make informed decisions. A real-time setup of the urban flood forecast model developed by simplifying the less important hydrological processes in the intergrated hydrological model. This project does not deal with improving rainfall forecast methods, but instead uses available forecasts methods, such as the nowcast method developed by Aalborg University. The numerical weather data is chosen from the HYPE (Hydrological Predictions for the Environment, smhi.se) and HIRLAM model (High-Resolution Limited Area Model, hirlam.org). Radar and numerical weather model data are used to forecast rainfall with different lead times. Aalborg is a city located in the northern part of Denmark with approximately 135.000 inhabitants, covering an area of 111 km2. The climate in the northern part of Denmark is characterized by cool summers and mild winters and a yearly precipitation between 600 and 750 mm. The Aalborg case focuses on Kærby, mainly a residential area, and Håndværkerkvarteret, an industrial area, south of central Aalborg. The interaction between streams, drainage system, groundwater, and variability in rainfall is examined using Kærby and the Håndværkerkvarteret as two linked case studies. Even though both study sites are heavily influenced by each other, different conditions causes urban flooding in each area. High groundwater table, low elevation level, and the fact that Kærby is enclosed by two streams, makes Kærby an ideal case-study for studying the effects of integrating the complete hydrological cycle in respect to urban flood forecasting. Håndværkerkvarteret consists of mostly impermeable concrete with a few open grass areas. As such the urban flooding is more likely linked to the hydraulic capacity of the outgoing streams. Kærby and Håndværkerkvarteret are located in a low point between to higher points to the east and west. On the picture below is an interactive visualization of DEM of Østerå catchment with a resolution of 10×10 meters. The vertical height is exaggerated by a factor of 10. Click on the image beneath to try it out! In both Kærby and Håndværkerkvarteret the urban hydrological system is monitored through a campaign. The goal of this data campaign is to identify the conditions that cause flooding in both areas and to provide the necessary in- and output data in order to validate the hydrological models. A local experimental setup is developed to inquire knowledge of stream water level and flow, groundwater level, and overflow discharge from the sewer system. The data transmission system is automated using GSM modules sending data feedback to an FTP server once a day. Later on this automated data logging system will be used for real-time hydrological flood modeling and forecasting with much higher frequencies of data transmission. Rainfall is measured using existing local rain gauges and indirectly measured using two x-band and one c-band radars. The experimental setup consists of 6 stream water level gauges, 3 groundwater level observation drillings, 3 overflow discharge registrations, and 3 pump discharges (on/off and volume estimate), see Figure 3. Precipitation data is available from several sources, including rain gauges, disdrometers, radar imaging, numerical weather models, and radar nowcasts. The danish rain gauge network, see Figure 1, covers the topographic catchment with 7 rain gauges with historical data back to the late 1990’s. Approximately 1.7 km from the project area in the BEWARE project, where a parking lot equipped with a disdrometer and 9 tipping bucket rain gauges with real-time data transmission and historical data back to 2013. Two x-band and one c-band radar are available for radar imaging of precipitation of the project area. A preliminary model is setup, wherein a coupled hydrological and hydraulic model is developed. The hydrological model is a national model of the freshwater cycle in Denmark built in the MIKE SHE environment, also known as the DK-model. The hydraulic model is a local drainage model built in MIKE URBAN. The following processes are included: overland flow, evapotranspiration, unsaturated flow, saturated flow, stream flow, and sewer flow. See Figure 3 for the model setup. Results from the flood models in respect to spatial and temporal resolution, forecast lead times, forecast methods, computational time, storm severity, and flood model setup are analyzed. The forecast performance is quantified by its ability to predict flood events related to the end-user needs. End-user requirements such as purpose, value, and reliability are investigated for the flood forecast system. This project will contribute with new methods to the current state of the art urban flood forecast modeling and bring significant knowledge about the interaction between the hydrological processes and how they affect urban flooding. The predictability, uncertainty, and reliability of a new developed integrated urban flood model are examined and scrutinized in order to evaluate the urban flood models usefulness in practice for the end-users. In this study, the sensitivity and uncertainty are derived for a case without any observation data available. The sensitivity is investigated through a global sensitivity analysis. High sensitive parameters are considered for an uncertainty analysis using a fuzzy approach. A fully developed urban flood forecasting model including a 2D overland flow model is presented and evaluated. Uncertainties are displayed and its application for end-users is discussed.